The chiefs of the Mi’kmaq Confederacy on P.E.I. say it is “emotionally very hard” to see monuments of historical figures who had a hand in the “deplorable treatment” of their ancestors, but they say those monuments should not necessarily be torn down or renamed. Instead, say Abegweit First Nation Chief Brian Francis and Lennox Island First Nation Chief Matilda Ramjattan in a statement emailed to CBC, the focus should be on creating buildings and monuments that honour Indigenous heroes, and adding plaques to existing monuments of colonial leaders that outline their “shameful behaviour” alongside their successes. “The current debate has become counterproductive,” said the chiefs, who are co-chairs of the board of directors of the Mi’kmaq Confederacy of PEI. In Halifax, there have been calls for the removal of a statue of its founder, Edward Cornwallis, who in 1749 issued a bounty to anyone who killed a Mi’kmaq person. In Montreal, the removal of Jeffrey Amherst’s name from a street sign has renewed calls for the renaming of Port-la-Joye – Fort Amherst on P.E.I. Amherst, a British general, penned a letter in 1763 advocating wiping out Indigenous people by spreading smallpox among them. And in Ontario, groups are calling for the removal of Sir John A. Macdonald’s name from public schools. While he is celebrated for his role in building the country, he is also implicated in the creation of Canada’s Indian Residential School system. Perhaps nowhere is Macdonald more visible than on P.E.I., the birthplace of Confederation. Much of the Island’s tourism industry is built around stories of the fathers of Confederation. 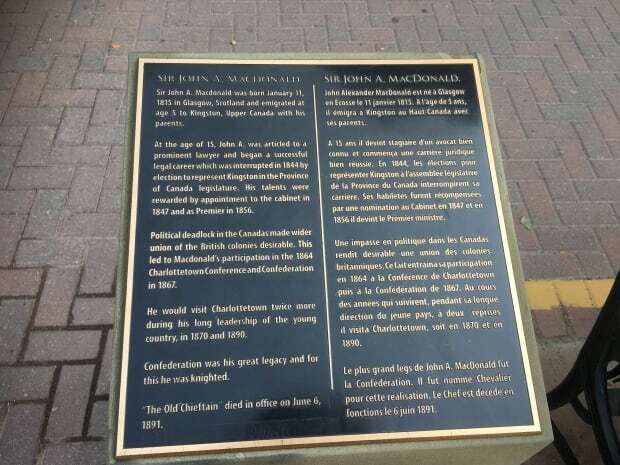 There is an iconic statue of Macdonald on a bench at the entrance of Victoria Row, one of the busiest locations in Charlottetown. “The attempted annihilation of a segment of the population, the forced removal of children from everything they know because of perceived cultural superiority, are never excusable, regardless of the time period,” they said. But when asked if these monuments should be removed, the chiefs said they are “guided by the wisdom” of Sen. Murray Sinclair, the former chair of the Truth and Reconciliation Commission of Canada. “Senator Sinclair has gone on record as saying that the approach of tearing down statues is not in keeping with reconciliation because it ‘smacks of revenge’, when the focus should be on creating balance in the relationship,” they said.